FAA’s arrogance in ignoring NextGen noise impacts is legendary, but that arrogance is amazingly exceeded by Bill Shuster, Chairman of the House Committee on Transportation and Infrastructure. And, it is all a glaring conflict of interest. On Day One, Mister Shuster is waterboy for lobbyist Airlines for America (A4A), pushing a poisoned legislative proposal that would grant the airlines control of ATC via a so-called ‘not-for-profit privatization’ scheme; on Day Two, Mr. Schuster is ‘on the beach and tipping cocktails’, hanging in Florida with his best buddies: lobbyist A4A CEO Nick Calio, and A4A VP of Government Affairs Shelley Rubino. Oh, and the A4A Government Affairs VP also happens to be ‘engaged’ in a personal relationship with Mr. Shuster. Despite their strong conservative opposition, at the Markup, eight days after the rollout, conservative members rejoined ranks. Nearly every amendment vote produced a strict party-line split: Republicans (34 seats on the committee) consistently outnumbering Democrats (25 seats on the committee). Bear in mind, Shuster wanted to introduce this legislation a full year ago, but was forced to delay and retool, due to the growing FAA NextGen debacles. So, in total, the Shuster/A4A proposal is seeing opposition from everyone EXCEPT the cronies who stand to reap the core of the intended special interest gain: i.e., the only consistent support comes from industry (A4A and the airlines), the NATCA NEB members (all of whom are near retirement), and the Congress-critters who earn campaign contributions by advocating for this bad idea. At time 9:21:58 of the nearly ten-hour Markup, just prior to the quick series of final votes, Representative DeFazio offered this comment: “…(the amendments) are generally – how would you describe them – tweaks to the imaginary ATC corporation (laughter) … they would make it better, if it happened (more laughter)….”. In other words, the Shuster/A4A proposal distills down to just one big joke – a waste of our time and money. This Circus is FREE, and it Comes to YOU! 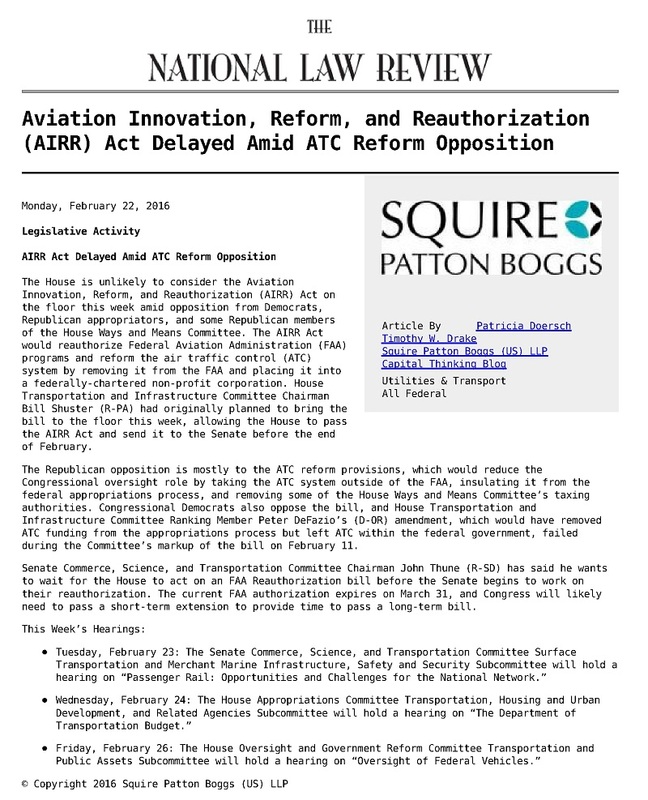 In an ideal world, our elected officials would tend to the business of keeping our transportation modes moving, such as by non-politically passing FAA’s re-authorization in a timely manner. This world, lately, is not looking too ideal. Here is the 9.5-hour video. Actual hearing starts at time 0:11:43. Went into recess for just over an hour at 5:56:30, resuming at 7:13:58. A ’10-minute break’ at 8:50:55, resuming at 9:16:46. After a year with record high temperatures, extreme drought, and horrific wildfires, our elected leaders may finally be moving past their longstanding political impasse. Ten of the more moderate Republican representatives have signed on to a call for action on climate change. Doing so, they are bucking the entrenched position of their party, which has been to deny that climate change is connected to excessive consumption, particularly of fossil fuels. One of the newest cosponsors is Frank LoBiondo, a Republican from New Jersey. Congressman LoBiondo is in a very powerful position, because he is a member of the House Transportation & Infrastructure Committee and chairs the Subcommittee on Aviation. As such, he is one of a tiny few U.S. leaders who can steer FAA’s future. A future that needs to include aviation fee and tax reform, so that aviation operators are strongly incentivized to minimize fuel consumption. With that, it seems entirely conceivable that Congressman LoBiondo could merge his background with his power, and perform the biggest accomplishment of his political career: take a REAL stand for the environment. In one fell swoop, he could significantly reduce both noise and carbon pollution, while also ensuring more people get direct airline flights, cutting out many of those out-of-the-way stops at today’s mega-hub airports. His subcommittee is currently being worked over by lobbyists, all agitating for taking ATC out of FAA (sometimes called ‘ATC privatization, or ‘ANSP autonomy’). The lobbyists dress the proposal up as if it will make things better, failing to clarify the main beneficiaries will be themselves, not the Public. Ignoring what the Public wants/needs, FAA and the industry WANT a federally chartered, non-profit organization because it will further insulate them from accountability. In reality, the players in today’s Av-Gov Complex want to be accountable only to themselves (a.k.a., the ‘stakeholders’). …there will be no reduction of Congressional FAA oversight until FAA shows reliable and accountable performance and transparency. Until FAA cleans house, this Congress will never — and no Congress should ever — reward the incompetence and arrogance being demonstrated by the employees and their tone-deaf agency. In other words, FAA needs to clean up their growing NextGen mess; give local authority back to local officials, so communities can manage aviation noise; become transparent. Quit serving only the industry … start serving the taxpayers. So, What Might LoBiondo’s Next Move Be? Here’s an idea. LoBiondo should move to implement a revenue-neutral carbon tax for all aviation fuels. We could very effectively use aviation as an example, to demonstrate how well the revenue-neutral carbon tax concept can work, and to set a high standard for the other energy consumption sectors to follow. Nobody denies that we need to vigorously manage our entire fossil fuels diet (gas, oil, and coal, for transportation, heating, industry and power generation). So, why not start with a focused program, aimed solely at aviation carbon consumption? …would strongly encourage the major airlines away from routing passengers via out-of-the-way mega-hubs, to instead set schedules that route more passengers nonstop or via smaller, more manageable hubs aligned close to the direct route of flight. …would impose natural limiting forces, to discourage overdeveloping hubs into mega-hubs. We have seen enough; at some point any hub airport grows to become too big; there is a diseconomy of hyper scale. …would quickly bring relief to impacted neighbors suffering from nonstop aviation noise, particularly at the busiest mega-hub airport cities: Chicago and Atlanta. 9/17/2015 – Bernie Sanders Slams GOP for Ignoring ‘Planetary Crisis’ of Climate Change at the second second GOP debate. This looks like a solid news investigation, and something sorely needed to bring accountability to FAA. Reporter Mario Diaz conducted a four month investigation which has now aired as a series of news stories at PIX11 TV (New York). He found fifteen cases where air traffic controllers were found partially responsible for fatal air crashes, yet the controllers were never held accountable … and some returned to work in just days. He also notes that FAA paid out more than $100 Million to settle the fifteen identified cases, in which 54 people died. Mr. Diaz reported a lack of cooperation from many aviation officials who declined interview requests during the initial investigation. This included the controllers’ union (NATCA), the main pilots’ union (ALPA), Senator Jay Rockefeller (who chairs the senate committee that oversees transportation), Representative Frank LoBiondo (Chair of the House Subcommittee on Aviation), and most significantly the FAA. Those who did speak (and thus appear more devoted to real transparency) included: U.S. Senator Cory Booker (NJ), U.S. Senator Charles Schumer (NY), and Representative John Mica (FL). After Part One aired on April 28th, both FAA and Rep. LoBiondo provided brief responses. FAA’s response was incredible, in that the agency declared FAA’s dedication to ‘safety’ while ignoring their own failed safety record, as evidenced by this investigative series. FAA added a declaration that they investigate “…every accident and incident that occurs in the system to determine whether it could pursue further improvements to continue to enhance aviation safety.” This is patently false, as evidenced by the concealment of the 7/25/2010 controller error at Camarillo, CA, which FAA continues to pretend did not happen. FAA’s statement went even further, citing ‘Due Process’ concerns in defense of their failure to take accountable action against rogue controllers. Those who are aware of FAA’s terrible history of retaliation against Whistleblowers will find this especially galling because, in nearly all Whistleblower cases, FAA has done everything in their power — including lying repeatedly — to obstruct Due Process. So, there is a disturbing double-standard: destroy the Whistleblowers, while supporting those who participate within the corrupt culture. Want to see an example? See the extensively documented Lewis-FAA WB Case, related to the TV set pictured below. Reporter Mario Diaz presents his extensive investigation into the lack of accountability by FAA and air traffic controllers. He identifies cases where FAA air traffic controllers were found to have contributed to fatal air crashes, yet are still working in FAA’s control towers and en route radar facilities. In two examples, fatal accidents in both Texas and Florida, all pilots and passengers were killed after the controllers knowingly failed to advise pilots of lines of severe weather. Comments are mostly by controllers, and are ‘unappreciative’ of Diaz’ report. Congressman Sean Patrick Maloney of New York found FAA’s response was unacceptable, and vowed to send FAA a letter, demanding answers. U.S. Congressman Sean Patrick Maloney discusses the reason he has sent a letter to FAA Administrator Michael Huerta. The letter presents his concerns and asks specific questions, including “What transparency measures exist when the FAA investigates an accident?” The letter was also copied to Rep. Bill Shuster, the chairman of the Committee on Transportation and Infrastructure. Maloney sits on that same committee, which oversees FAA.